First, we are safe. We are in our hotel in Bishop, CA. But, I need to tell you the story of what happened in Death Valley toward the end of our Death Valley day on Tuesday. Our day started out in Las Vegas. Our purpose for visiting Vegas was for Julie to just SEE it and for me to revisit it (plus I wanted to see nearby Hoover Dam). I hadn’t been there in decades. Our reaction was the expected one—we were both pretty much repulsed by the craziness. Suffice it to say, it is not our type of town or vacation destination. We left as soon as we could and headed to Death Valley. As is often the case, pictures cannot accurately or adequately portray the beauty of nature in its own setting. I hadn’t known what to expect at this destination (remember, I didn’t plan the trip) so we both were completely astounded at the beauty and grandeur of the different geological formations. It was other-worldly and we commented many times how we felt like we were visiting other planets. Reality seemed suspended to fit in the experience of the variance of color and texture and shape and size of everything that exists in this valley between two mountain ranges. The temperature peaked at 119 degrees and was rarely less than 109. Hot took on a whole new meaning. I love this picture even though the geological formation isn’t the most beautiful. So, when we were almost done with our east-to-west tour of the National Park, we went through a section of curvy, twisting, up-and-down road. We saw other cars, but they were sparsely separated from each other. We had just rounded a curve when I heard the loudest sound I’ve EVER heard in my life. An explosion of sound like something coming turbulently and earth-shatteringly from the Middle Earth. My steering wheel started shaking violently and my trauma was instant. I knew that the car had somehow just exploded. Would there be an engine fire? Did all the tires explode at once and fall off and we were skidding on the frame of the car? Did the engine fall out? Were we going to fall off the cliff? WHAT WAS HAPPENING???!!! Thoughts raced through my mind faster than I could keep up because the decibels of that noise made absolutely no sense from any point of reference in my life. We stopped to see some sand dunes and I found out that sand gets VERY hot in 115 degree temperatures. HINT: Do not wear sandals across scolding hot sand. Julie started yelling as I just tried to keep the car on the road, which amazingly was kinda easy considering that it had just somehow exploded—or something! My heart was racing, my thoughts were spinning, trying to make sense with what was happening. Then I heard Julie yell “a jet….that was a fighter jet!” She figured it out in time to look out the window to see the jet heading straight down the side of the mountain we were driving on and then make a quick up and sideways turn and disappear. It had flown right over/beside us heading down the mountain. Seriously. Really? Yes. That happened. I think it took me at least 30 minutes to calm the inner shaking. Cognitive thought sometimes can’t over-ride a visceral traumatic experience. Julie was stoked that she saw the jet fly right by the window. She waited excitedly for the second one that never came. I just tried to calm down and realize that my car was intact and we were OK and still driving on the mountain drive. I was ever-so-grateful for an undamaged car and to be driving on a curvy (and now a bit less scary) road. Whew. We made it out of Death Valley and wound our way up north to a valley in California that is also nestled between the two largest mountain ranges in the state. Tomorrow we visit Yosemite National Park before making our way to my new home—Oakland, California. We will keep you posted. Brother Kerry Tried to Kill Us! JK. Best Tour Guide Ever! Let’s start with this: It’s been 90 degrees daily while Julie and I stayed for 4 nights and 3 days in Austin, Texas with Brother Kerry on our cross-country tour. On our first morning here, I agreed to go with Kerry on his morning walk. Ever since I decided to “retire” I’ve been too busy to exercise on any regular basis. Add to that the many goodbye lunches and dinners I’ve attended, I’m not at all fit. The walk through Kerry’s neighborhood had many hills. I returned in a very tired state after a 3-mile walk. Stevie Ray Vaughn statue along the river walk. After lunch we toured the Texas State History Museum. We learned everything one would need to know to understand why Texans believe they rule the world. (Just kidding again. We learned a lot.) We next went on a bike ride around the lake. What initially seemed like an innocent ride around a lake turned into a physical nightmare for me. The goal was 10 miles. The trail was mostly small rocks and too hilly for me. And let’s remember the temperature. 90 degrees. I had to cut the trip down to 7 miles. My muscles were sore and weakened. My back and shoulder muscles were already in knots. We later walked to Zilker Park for a free evening concert. Listening to the local singers with national fame seemed to be secondary to the concert experience itself. People-watching was our main activity. I learned that young people wear less clothes in Austin than Indianapolis. We slept well that night. On Thursday, Kerry thought it a good idea for us to PADDLE BOARD on Lady Bird Lake in downtown Austin—the same lake we biked around on Wednesday. Neither Julie nor I had ever paddle boarded before. Might I interject here that Julie has a hairline fracture on her foot which she closed the car door on (in the exact location of the break) on the first day of our trip. Surprisingly neither of us fell off our boards, but I wouldn’t count our experiences as successes either. I did stand up on the board, then I was afraid to get back down. The leg and foot muscles used trying to stay balanced were intense and hurtful. I did stand and paddle and paddled from a knee’ed position as well. Unless coerced, I don’t think I’ll be paddle boarding again any time soon, although. I walked with weak legs and exhausted body again. We next went to experience The Escape Room where we entered a small Gold Rush room together with five strangers, including three Montana cowboy teenagers and two California women. We had to find clues, utilize the clues to find other clues to utilize other clues to get 3 pieces of gold in the Gold Rush. [We started out the 3 days doing Texas things and then transitioned to California activities, e.g. the Gold Rush activity.] We had dinner at a local favorite taco place: Torchy’s. (Barack Obama ate there when he came into town) I had a fried avocado taco and a portabello mushroom taco—both excellent. Amy’s famous ice cream came next and then we watched the famous million bats fly out to forage the countryside at sunset. People come from everywhere to watch the amazing scene from the Congress Avenue Bat Bridge. Again, we returned home just exhausted. Julie and Kerry on the National Refuge hike. Today, we started the day early to lessen the effect of the high temperatures. We hiked miles in Balcones Canyonland National Refuge. Kerry normally does the hike in half the time, but we must remember that he just hiked up and down Mount Kilimanjaro with Brother Pat less than 2 years ago. The trail was very rocky and sometimes rough. The hike was mostly in the sun and I frequently had to rest in the shade of some smaller trees. The steady incline and the stifling heat wore me out as the birds serenaded us with every step. As much as I tried to show a courageous face, it seemed the accumulation of the strenuous activity this week got the best of me. My legs felt like mush after our three hour hike. We finished the ‘California’ part of the visit by watching Straight Outta Compton for our Friday night movie. Kerry packed our days solid with fun activities and worked very hard so we could get the real flavor of Austin–“Keep Austin Weird.” He was the best tour guide ever. Julie and I are heading out again this morning. We have to drive all day and we will still be in Texas at the end of the day—in El Paso. We have five days and four nights to go! …and we are a little more off today! I told Julie that she could plan the whole trip to California. I was too busy finishing up life in Indiana and a 20-year job. She had help from our Brother Kerry. So when we set out on Sunday, I really only had a rough idea of where we were going. I drove the whole day and when we left I just told my phone ap Waze that we wanted to go to Memphis, Tennessee and I took directions well. I will admit up front that I really had no idea where Memphis was (except somewhere in the state of Tennessee). I was really surprised to find us in Illinois! We were actually pretty far in to Illinois before I realized it. And THEN we found ourselves in MISSOURI! I mean, I thought we were headed south. And then we were sure we would be in Tennessee soon, but NOOOO, we passed through Arkansas!! We finally made it to Memphis and wended our way downtown where we had booked a cheap hotel. But let me back up a minute and tell you the highlight of our first day. We saw a sign that said World Largest Wind Chimes…Get off at the next exit! Of course we had to do it! So, this little town, Casey, Illinois, (this is how I found out we were in Illinois) had the world’s largest EVERYTHING!! Rocking chair, pencil, bird cage, wind chimes, golf tee, mailbox, ruler! Hilarious. So instead of getting back onto I70, we took Highway 40 for a long while just for a change of scenery. When I told my daughter Sierra that we actually drove away from a hotel due to shadiness, she texted back “That says a lot considering I remember staying in one [as a child traveling as a family] with a vibrating bed and swastikas on the walls.” Well, yes, that did happen. We barricaded the door that night. HA. We spent the entire morning today, Monday, at the National Civil Rights Museum in Memphis. It was one of the best museums I’ve ever seen. It is built in and around the Loraine Hotel where Dr. Martin Luther King Jr. was killed. I mean you get to look out the window of the hotel room at the exact location. You also get to be in the exact room where his killer watched and shot from. Astoundingly amazing and impactful. We rushed through to be able to leave after 3 hours. I could have spent an entire day there. I highly recommend it to everyone!! We next drove to Little Rock, Arkansas and toured Bill Clinton’s Presidential Library in the afternoon. Again, there was so much fabulous information and interactive exhibits. We loved both museums. We ended up in Hope, Arkansas for the night. Well, actually we are lucky to have ended up in Hope tonight. For a while when we left Little Rock, I had Google Maps and Waze both talking to me at the same time and giving me directions. Before we realized what was going on, we ended up on winding, tree-lined country roads and I could swear I heard some banjos strumming! At our Best Western motel I started talking to a couple of young men in the outdoor (and very warm) pool. Within one minute of meeting them, I found out that one man is the boss of the girlfriend of my nephew’s son who was killed last summer in Richmond, Indiana. Life is amazing. Goodbye, Adios, Sayonara, Namaste! It’s Been Real! The annual family reunion on Brother Tom’s 40-acre farm named Hawkwind (read more about Tom’s place here) was hot and fun. He lives up on a hill and two Sandhill Crane families live on his property. This year there are two babies with one of the couples. Their unmistakable sounds are such a joy for me since I just last fall drove up to the Jasper Pulaski Wildlife Refuge to see and hear the Sandhills as they migrated through Indiana. Five of the six of us siblings were here. Julie and I are heading to Austin Texas to visit the sixth, Bother Kerry. There are now a slew of little ones as our kids are now having kids….and so it goes. Some of us went on “the tour” around the hilly property sitting on straw bales in a rickety wagon pulled by a tractor. The highlights were a dead raccoon carcass in the front yard, two of Tom’s own campsites, the wrecked trees from the herds of deer that frequently come through. In fact, last night we saw eight deer walk through in a newly planted corn field. I have lately slept in the RV out by the barn when I stay here. I love the quiet, the birds, the crickets, the frogs, the hawks and the cranes. I pee outside in the middle of the night. I feel liberated peeing outside under the moonlight. Last night Julie slept in the RV with me as well. The last time I came in from peeing, I left the door open by mistake. The early morning birds woke us up an hour earlier than we had planned. We’re up, getting in our caffeine and scrambled eggs (Thanks, Donna!) preparing to hit the road on the first leg of the Jyoti & Julie Great Adventure Cross Country Tour. Today we head to Memphis to visit the National Civil Rights Museum at the location where Dr. Martin Luther King, Jr. was killed. We are staying in a (maybe) shady motel downtown. Julie is slightly apprehensive; I told her I’d protect her. I left Indiana when I was 18. I came back when I was 35 after my divorce. The girls were 2 and 4 years old. I stayed 27 years. I came back to live near my family spread out over Indiana, Ohio and Michigan. And now I leave again for family…to live near my girls in Oakland. It is in Indiana where I raised my girls, took care of my house/home, found my Democratic family and spent time with the family that I came back home for. Indiana has nurtured me well. And today I leave once again. This process has been so very interesting to me. I have always been a “present moment” sort of woman, so I really just live and appreciate where I’m at while I’m there. So, I don’t feel particularly sad, nor do I feel particularly excited. Today we head out and that’s all that matters. Today. I left Indianapolis 7 days after my last day of employment with Indianapolis Public Schools. And what a week it was. I started saying my last goodbyes to people about three weeks ago. I’ve had many Bon Voyage lunches and dinners, some with people I’ll see again, many with people I most likely will never see again. That is a strange feeling and interaction. But I lived through every single goodbye with sadness each time. It was difficult saying goodbye to my best friends, especially to people who have helped me so much in the last year’s nomadic process. Without them, today would not have been possible. I stayed at Jessica’s house several times in the last 6 months. Sometimes I stayed with her and her husband because I had no other place to stay and other times I dog-sat for her two middle-aged and elderly puppies when they left town. I have loved staying at their home as I just always felt like a regular household member while there. My presence didn’t seem to interrupt any of the daily flow. AND I loved spending time with the two adults and the two puppies. Yesterday, Friday, was my last day in Indy. And the canine boys and I were the only ones there when I drove off. Manny is an old man and slept through the process. Bodie, however, sensed that I was leaving him. He and I have become very close through our time together. If I was stationary, he was on my lap. He slept in my bed—usually under the covers—when his parents were gone. We were truly buddies. So he whiningly followed me around while I packed my things and packed up the car. It was evident that he knew what was happening. When the car was packed and I was ready to take off, I picked him up and we said our goodbyes. We both cried. Then he hopped up on ‘my’ bed and sat on his throne to watch me walk out the door for the last time. He seemed sad. Bodie, my buddy. My last goodbye. Today is our family reunion at Brother Tom’s farm in Angola, Indiana. Tomorrow, Sunday, my Sister Julie and I take off for the Jyoti & Julie Great Adventure. Our final destination is Oakland California. Our first stop is Memphis Tennessee! Stay tuned! My First Post-Retirement Activity? Spreading Horse Poop, Of Course! I stopped being an IPS employee at 4pm Thursday, June 10th. By 5:45pm I was at the country homestead of my nephew Zachary’s and his wife Lindsay’s country homestead outside of Kokomo. I had never been there and really wanted to experience their country life before I left. I lived on a farm or in farm country until I left for college, so country living has always held a soft place in my heart. Zachary is very proud of his antique Case sign. My Brother Mike has four sons and all five are obsessed with antique Case tractors to varying degrees. Mike and two sons have barns and huge sheds devoted to that hobby. They restore the tractors and show them off any time they can. Last weekend, Mike’s sons and daughters-in-law held a great 70th birthday party for Mike at his own farm in Logansport. (Read about Mike’s place here.) On the morning of the party, he and all four sons each drove one of their antique tractors in a parade through the country with about 35 other antique tractor drivers. It’s a time to show off your prized possessions and hang out with others who share your passion. The father and sons talk to each other through walkie-talkies from their respective tractors during the parade. At Zachary and Lindsay’s place, I got the grand tour: The very old barn, housing a couple of very old Case tractors, a very old manure spreader, a horse named Moe, and lots of other old barn stuff that you can imagine. They have a HUGE shed, housing Case machinery (all old of course), where Zach built himself a workshop where he performs his machinery miracles. The wonderful 19th century farmhouse is a big 2-story cube with flowers beds surrounding it. They are raising baby turkeys (to eventually eat)—which Zach really enjoyed teasing me about since I am a vegetarian. They have chickens that keep them (and lots of others) in beautiful brown eggs. I learned that eggs can last unrefrigerated up to three months if you don’t wash the protective layer off. Six long-haired and beautiful barn cats pranced around us wherever we went. As is typical of northern Indiana farm country, you can see for miles in every direction. When’s the last time you saw an antique manure spreader filled with horse poop? However, kitty-cornered across the road, is a many-acred woods which holds two divine things: 1. Morel mushrooms in the spring, and 2. An eagles’ nest in clear view from their front yard. I missed the morels, but got to see the eaglets in the nest and their parents flying around over the newly-planted soybean field. For someone who is semi-obsessed with eagles, I was thrilled! The idyllic spreading of the poop. After dinner, Zachery asked me if I wanted to spread the horse manure. YES! Of course! We hooked up the crazy-old spreader to the tractor and off we went! I started out slowly, but opened it up on the back stretch. I’m not sure when I’ll get to drive a tractor again; I felt like a queen! I treasured the opportunity to relive a peaceful country evening. A beautiful Indiana country sunset. We watched the sun set in front of the big weedless vegetable garden. The cats ran around the yard as we said good-bye. I’m not sure when I’ll come back to Indiana again. As I head toward my very urban Oakland home, I treasured my first post-retirement evening in such a peaceful setting. Family will always be the connector between past and future. Family abides all things. Even horse poop. Thanks Zachary and Lindsey! I feel like I am caught between two worlds. I am jumping across a canyon and am trying not to fall in. You know when one big wave comes in and then as it goes back out, and it smacks into the wave that is coming in? They crash together; the wave coming in overcomes because it has more force at that moment. I feel like I am at the nexus of the two waves crashing into each other. The wave going back out is my present life: it is strong, it is vibrant, it is important, but it has left the shore and is heading back out to sea. The stronger wave is my future: it is strong, it is vibrant, it is important and it has the momentum of the moment. Leaving my home and all of my friends that I have made over the past 27 years is so very hard. The experience of the day was the two-day process of leaving my school—my five-day-a-week home for 13 years. I love my job. I love my students. I love my fellow staff members. 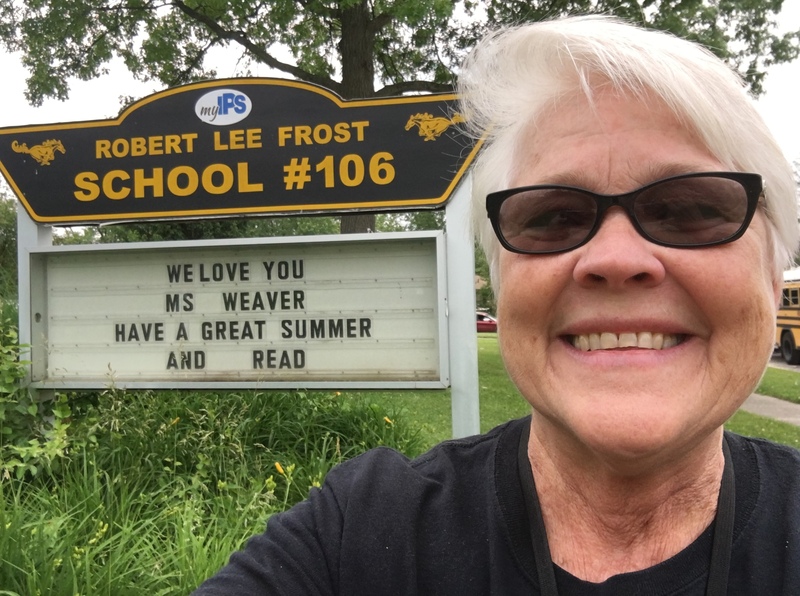 Today was the students’ last day. I am sure that I received more hugs today than in the past 10 or 20 years put together. (One spontaneous group hug ended up in a crunch on the ground!) 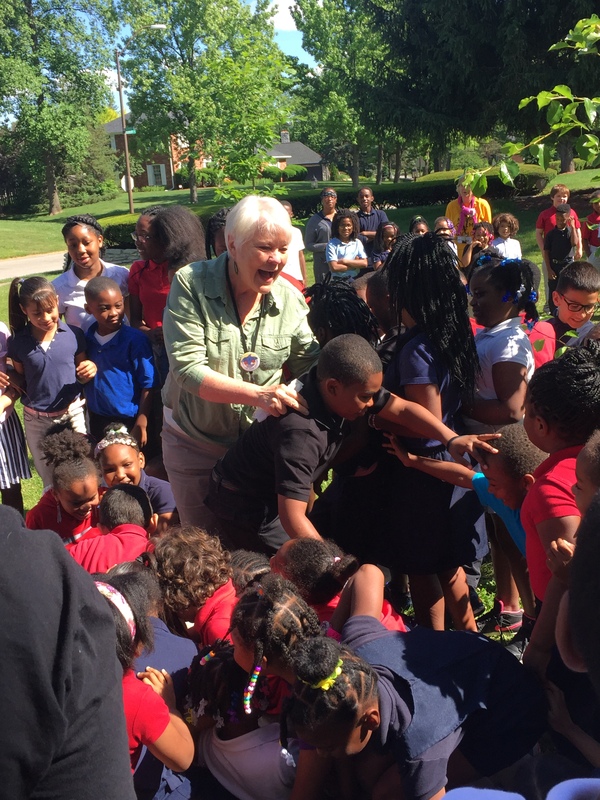 I met with every student every week this school year for character education classes. I’m not sure who loved getting together more—me or them. I can only hope that they actually retain some of the lessons we discussed. There were tears, a lot of tears, mostly mine, some from them. 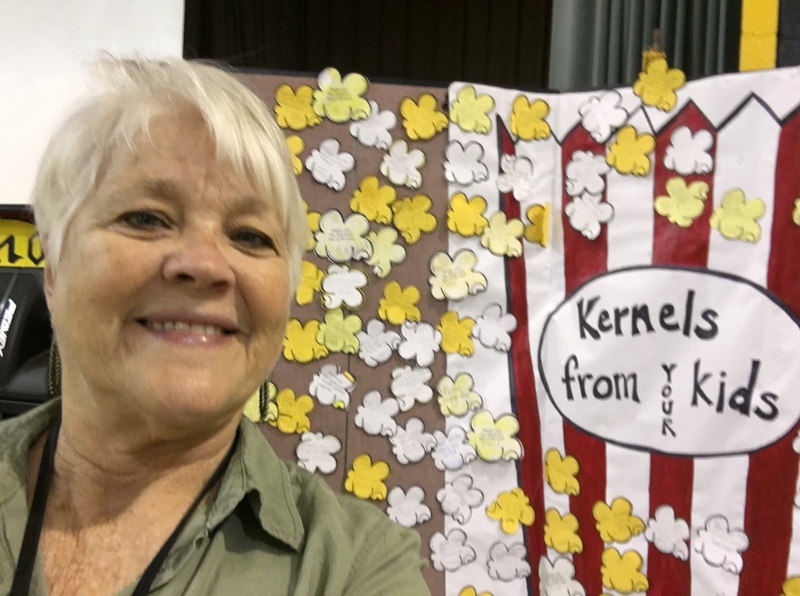 The students all wrote notes to me on “kernels” of popcorn. I’m saving them to read on my cross-country trip. The school held a surprise convocation for me today with a touching video tribute. One little boy with major emotional problems spoke to me on the video. Lately he only needed me to enter the room for him to calm his tantrum and settle back down. He had a difficult time talking to me directly, but in the video he spontaneously said that he loved me. He had to leave the gym before the end of the convocation and later when I went to talk to him and to give him some private time, he acted tough like he didn’t need it. At that moment, I knew that I could never really know or understand the impact that we who work in schools have on our students. We just have to keep trekking forward with faith that we are making a difference in some lives. This is after the huge group hug went awry. After the convocation, the entire school went outside for the next surprise: a flowering tree planted in my honor with a plaque beside it. (When I went out—last—and everyone was in one big circle, I thought we were going to play some big game of Duck Duck Goose!) After this ceremony, I foolishly announced that I was giving hugs and I got mauled. We all fell to the ground together! Teachers then organized a more orderly hugging line. Another last round of hugs as the children got on their buses and headed home. I’ve been a School Social Worker for 20 years. Watching the last buses pull away with my loves on them seemed a bit dreamlike. Tomorrow, I must say good-bye to my teaching friends, my cohorts, my buddies. Last week, they surprised me with a dinner at a fabulous restaurant. There was cake and cards and plenty of laughter. I don’t know how I’m going to say good-bye tomorrow. I really don’t know. I’ve been meeting with many of my other friends in small groups for lunch and dinners to say good-bye. It is not easy. I’ll miss everyone so very much. They are all in the wave that enjoyed riding in and resting momentarily on the sand, luxuriating in that suspenseful second before turning around and heading back out to the sea to remix with the ocean once again. They all left their mark in the sand—in my heart. And it is then that the outgoing wave smashes head-on to the next wave on its way in. When they meet each other they crash and rise up, becoming one for just a moment. That is me—right now. I am going out after a great ride in Indianapolis and I am simultaneously heading to shore with a new energy and vitality. The incoming wave is my future. I have daughters and a granddaughter waiting for me in Oakland. I have a whole cohousing community waiting for me to finally arrive. I’ve been a member for over 2 years and I already love them dearly as I’ve attended the meetings via the internet and met with them in person when I visited. I simply cannot wait to be with them in my new condo, in my new building, in my new community. So, you see, I’m at that crest point, fluctuating back and forth between sadness and excitement. I’m living in my wonderful past/present and my wonderful future/present at the same time. I often feel overwhelmed and break out in tears. Happy tears, sad tears. Suffice it to say, life is good. Oh, so good. I am blessed.